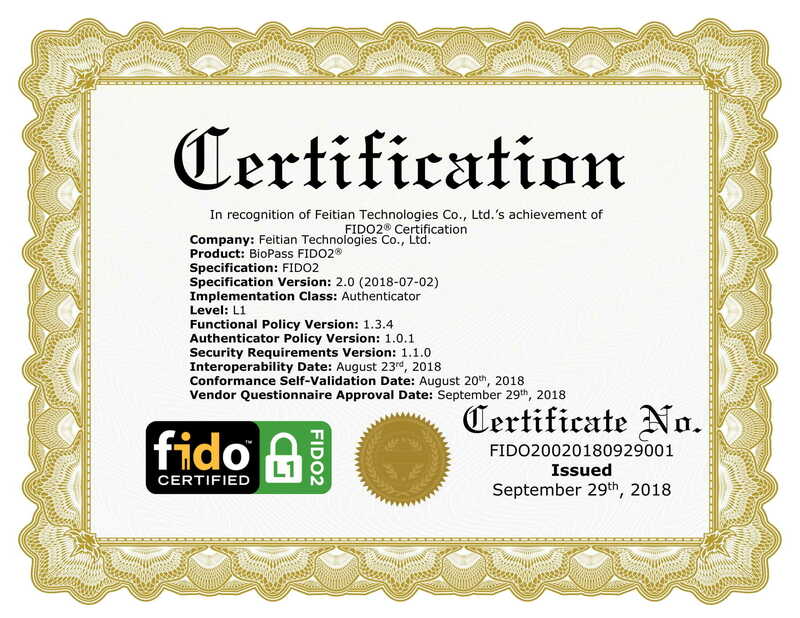 BEIJING, CHINA and SANTA CLARA, CA – On September 26, 2018, the FIDO Alliance announced through a Press Release that the leading technology companies were beginning to ship the products for the newly launched FIDO2. 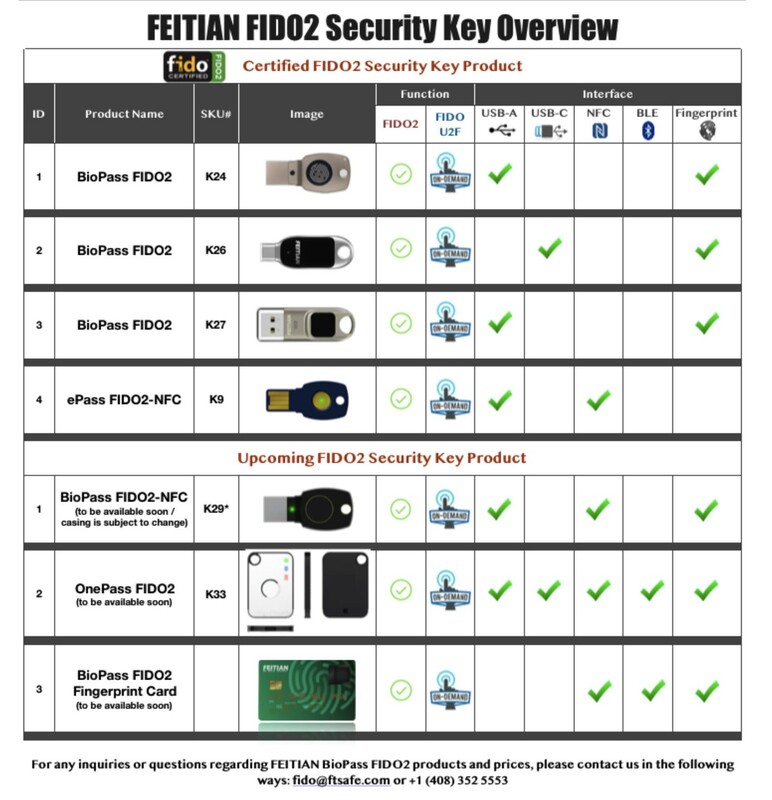 Today, FEITIAN Technologies US is announcing that it is now beginning to ship their FIDO2 Security Key products. The FIDO2 authentication technology is comprised of the W3C’s Web Authentication specification and the corresponding Client to Authenticator Protocol (CTAP) from FIDO Alliance. Collectively, these standards enable users to leverage common devices to more easily authenticate to online services through mobile and desktop browsers. FIDO2 supports a variety of authentication use cases and experiences, including password-less, second-factor and multi-factor for the highest levels of assurance. Password-only logins can now be replaced with easy user gestures using embedded biometrics (facial recognition, iris scan, fingerprint swipe) and/or portable security keys. • ePass FIDO2®-NFC (K9) with NFC / USB-A Interfaces. “We are excited to empower enterprises and online service providers who use these FEITIAN FIDO2 products to protect themselves and their customers from the risks associated with passwords, through multiple major web browsers including Chrome, Firefox and Microsoft Edge, as well as Android and Windows 10 which will have built-in support for FIDO Authentication. As a Board member of the FIDO Alliance and a leading provider of strong authentication, FEITIAN is committed to supporting the new FIDO2 standard within our full range of products and providing password-less authentication through biometrics to securely access across platforms in a trusted manner.“ said Tibi Zhang, Vice President, General Manager at FEITIAN Technologies US, Inc.
FEITIAN (Pronounced: “FAY-tee-en”) Technologies, www.ftsafe.com, is a public company with the US headquaters located in Santa Clara, CA, established in 1998. The company is dedicated to the cyber security industry and provides a full range of authentication and payment products and solutions. Based on core technologies of Chip Operating System with proprietary intellectual property rights, FEITIAN’s product lines feature Contact and Contactless Smart Cards, EMV Chip Cards, Payment Terminals, FIDO Server & FIDO Security Keys, and User Authentication Solutions for Secure Online Banking and Transaction Security. Our end-to-end turnkey solutions include secure hardware, operating systems, middleware, software application, and services such as personalization and remote lifecycle management.